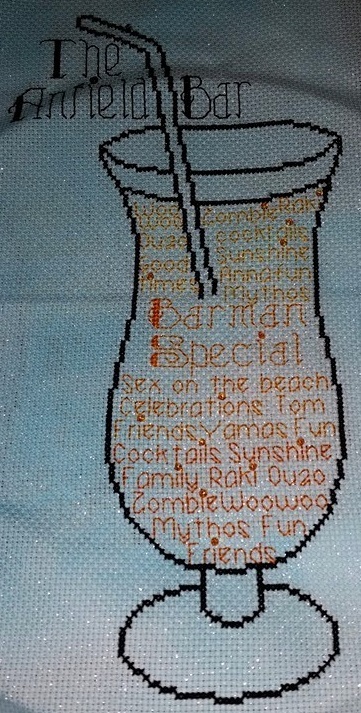 Cocktail In Words is a unique outline chart measuring 65 stitches wide by 162 stitches high, and uses 4 DMC colours. It is perfect for hand dyed fabric. If stitched as charted, and on 14 count aida, it is estimated that you will need 1 standard skein of each thread to complete it. The main picture shown was stitched by Tracy. The second picture was stitched by Becki and is a personalised version of this chart. The third image is the computer generated preview of the chart you will receive. Kim made the original personalised chart for my self to my specifications. I was soo pleased with all of kims hard work. She was very quick in producing this to my requirements and I was delighted with the result. Kim even assisted me in choosing material and thread to complete the design in. couldn't have asked for better service.